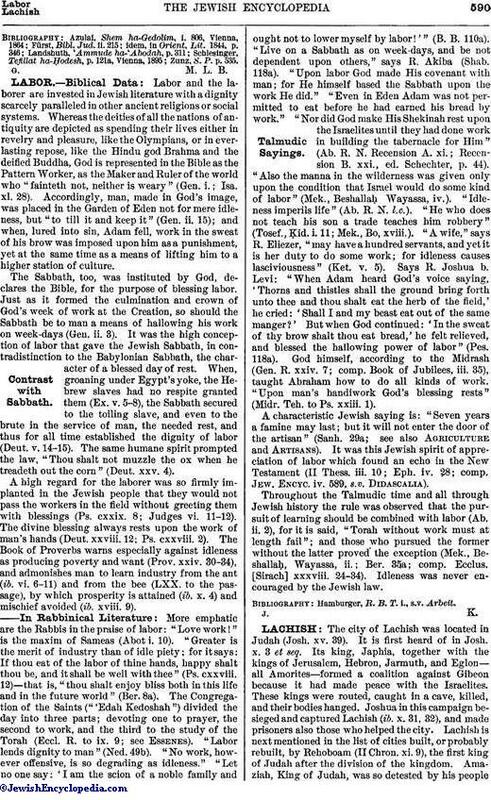 Labor and the laborer are invested in Jewish literature with a dignity scarcely paralleled in other ancient religions or social systems. Whereas the deities of all the nations of antiquity are depicted as spending their lives either in revelry and pleasure, like the Olympians, or in ever-lasting repose, like the Hindu god Brahma and the deified Buddha, God is represented in the Bible as the Pattern Worker, as the Maker and Ruler of the world who "fainteth not, neither is weary" (Gen. i.; Isa. xl. 28). Accordingly, man, made in God's image, was placed in the Garden of Eden not for mere idleness, but "to till it and keep it" (Gen. ii. 15); and when, lured into sin, Adam fell, work in the sweat of his brow was imposed upon him as a punishment, yet at the same time as a means of lifting him to a higher station of culture. The Sabbath, too, was instituted by God, declares the Bible, for the purpose of blessing labor. Just as it formed the culmination and crown of God's week of work at the Creation, so should the Sabbath be to man a means of hallowing his work on week-days (Gen. ii. 3). It was the high conception of labor that gave the Jewish Sabbath, in contradistinction to the Babylonian Sabbath, the character of a blessed day of rest. When, groaning under Egypt's yoke, the Hebrew slaves had no respite granted them (Ex. v. 5-8), the Sabbath secured to the toiling slave, and even to the brute in the service of man, the needed rest, and thus for all time established the dignity of labor (Deut. v. 14-15). The same humane spirit prompted the law, "Thou shalt not muzzle the ox when he treadeth out the corn" (Deut. xxv. 4). A high regard for the laborer was so firmly implanted in the Jewish people that they would not pass the workers in the field without greeting them with blessings (Ps. cxxix. 8; Judges vi. 11-12). The divine blessing always rests upon the work of man's hands (Deut. xxviii. 12; Ps. cxxviii. 2). The Book of Proverbs warns especially against idleness as producing poverty and want (Prov. xxiv. 30-34), and admonishes man to learn industry from the ant (ib. vi. 6-11) and from the bee (LXX. to the passage), by which prosperity is attained (ib. x. 4) and mischief avoided (ib. xviii. 9). More emphatic are the Rabbis in the praise of labor: "Love work!" is the maxim of Sameas (Abot i. 10). "Greater is the merit of industry than of idle piety; for it says: If thou eat of the labor of thine hands, happy shalt thou be, and it shall be well with thee" (Ps. cxxviii. 12)—that is, "thou shalt enjoy bliss both in this life and in the future world" (Ber. 8a). The Congregation of the Saints ("'Edah Kedoshah") divided the day into three parts; devoting one to prayer, the second to work, and the third to the study of the Torah (Eccl. R. to ix. 9; see Essenes). "Labor lends dignity to man" (Ned. 49b). "No work, however offensive, is so degrading as idleness." "Let no one say: 'I am the scion of a noble family and ought not to lower myself by labor!'" (B. B. 110a). "Live on a Sabbath as on week-days, and be not dependent upon others," says R. Akiba (Shab. 118a). "Upon labor God made His covenant with man; for He himself based the Sabbath upon the work He did." "Even in Eden Adam was not permitted to eat before he had earned his bread by work." "Nor did God make His Shekinah rest upon the Israelites until they had done work in building the tabernacle for Him" (Ab. R. N. Recension A. xi. ; Recension B. xxi., ed. Schechter, p. 44). "Also the manna in the wilderness was given only upon the condition that Israel would do some kind of labor" (Mek., Beshallaḥ Wayassa, iv.). "Idleness imperils life" (Ab. R. N. l.c.). "He who does not teach his son a trade teaches him robbery" (Tosef., Ḳid. i. 11; Mek., Bo, xviii.). "A wife," says R. Eliezer, "may have a hundred servants, and yet it is her duty to do some work; for idleness causes lasciviousness" (Ket. v. 5). Says R. Joshua b. Levi: "When Adam heard God's voice saying, 'Thorns and thistles shall the ground bring forth unto thee and thou shalt eat the herb of the field,' he cried: 'Shall I and my beast eat out of the same manger?' But when God continued: 'In the sweat of thy brow shalt thou eat bread,' he felt relieved, and blessed the hallowing power of labor" (Pes. 118a). God himself, according to the Midrash (Gen. R. xxiv. 7; comp. Book of Jubilees, iii. 35), taught Abraham how to do all kinds of work. "Upon man's handiwork God's blessing rests" (Midr. Teh. to Ps. xxiii. 1). A characteristic Jewish saying is: "Seven years a famine may last; but it will not enter the door of the artisan" (Sanh. 29a; see also Agriculture and Artisans). It was this Jewish spirit of appreciation of labor which found an echo in the New Testament (II Thess. iii. 10; Eph. iv. 28; comp. Jew. Encyc. iv. 589, s.v. Didascalia). Throughout the Talmudic time and all through Jewish history the rule was observed that the pursuit of learning should be combined with labor (Ab. ii. 2), for it is said, "Torah without work must at length fail"; and those who pursued the former without the latter proved the exception (Mek., Beshallaḥ, Wayassa, ii. ; Ber. 35a; comp. Ecclus. [Sirach] xxxviii. 24-34). Idleness was never encouraged by the Jewish law. Hamburger, R. B. T. i., s.v. Arbeit.